We were given a basket of goodies from Kraft and asked to come up with our own recipe. How fun, especially when the basket contained two of my favorite ingredients.... chocolate and marshmallows! I knew instantly I wanted to make cookies. 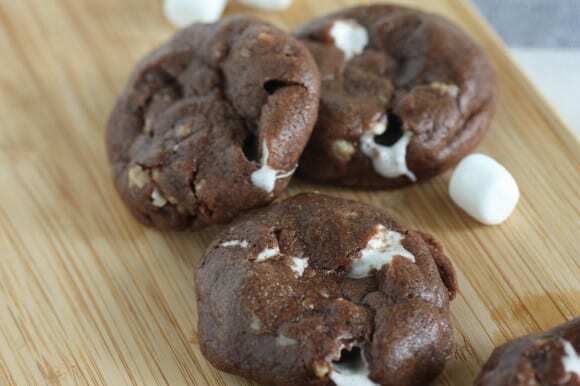 But sometimes it's hard to add marshmallows to cookies because when you bake them, the marshmallows can sort of evaporate. So we decided to try something different. 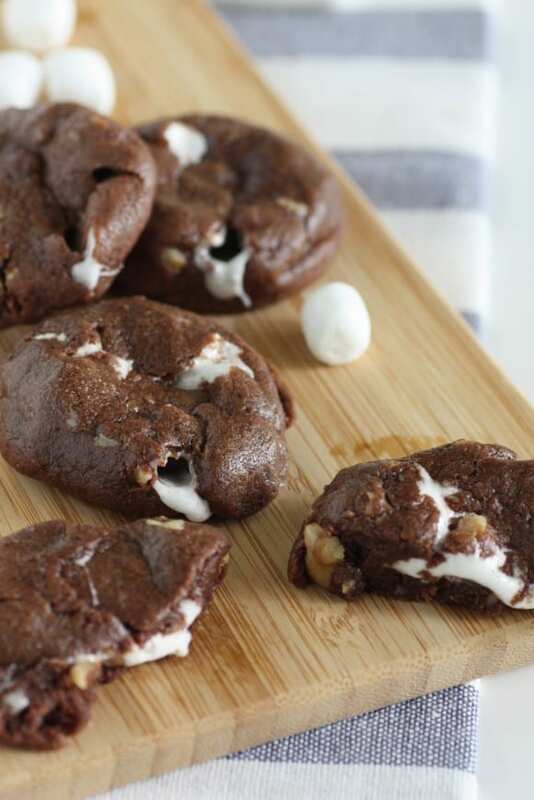 We froze the mini marshmallows, then placed them inside the cookie dough before baking. And it totally worked! 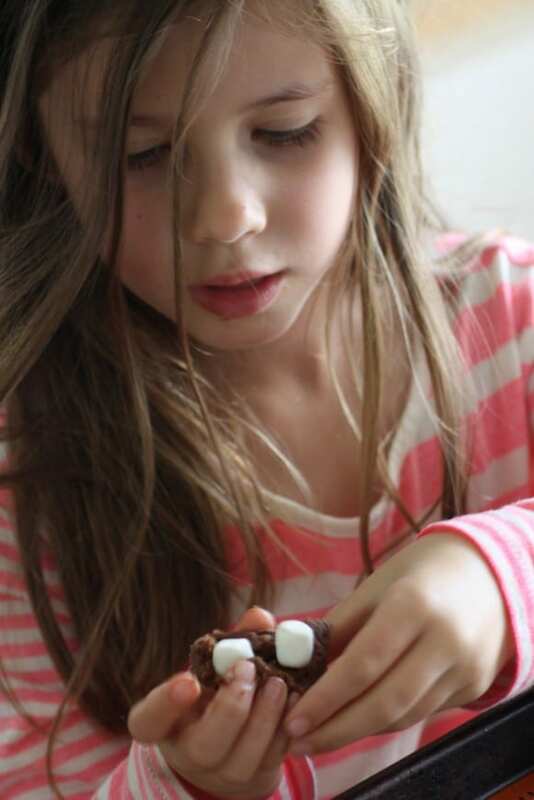 Here's Lainey wrapping the cookie dough around three mini marshmallows. Also, I added walnuts to the recipe because I like have a nutty crunch to my chocolate cookies, but feel free to leave them out. A few hours before you start, take two cups of mini marshmallows and put them in the freezer. Take out two sticks of butter and let them come to room temperature. In a large bowl, mix the flour, baking powder, and salt and set aside. In a second bowl, add the butter, eggs, brown sugar (firmly packed), granulated sugar, and vanilla. Beat on high for two minutes. 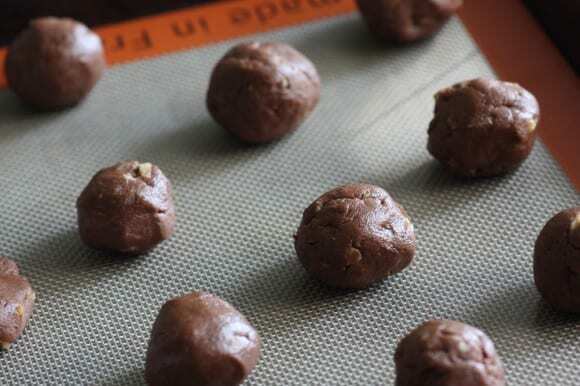 Break the chocolate into squares, and melt in a double broiler, or microwave on high for one minute. Add the melted chocolate to the wet ingredients, and mix until completely incorporated. Mix the dry ingredients into the wet in thirds. Crumble the walnuts. and fold into the dough. Chill for 30 minutes. Take the marshmallows out of the freezer. 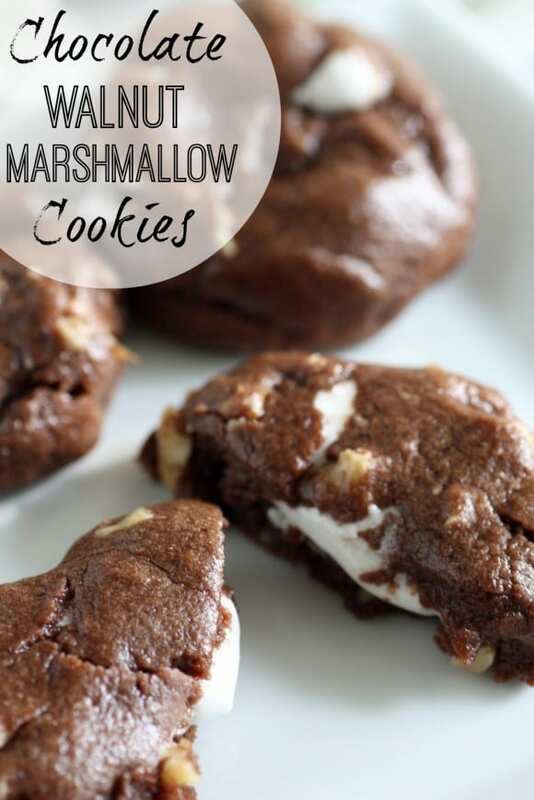 Use about two tablespoons of dough and press three mini marshmallows into the center. Ball the dough up and around, completely covering the marshmallows. Bake for about 8 minutes, until the cookies are just barely cooked. If you overcook, the marshmallows will melt and dissolve. The cookies will still taste great, but you won't get the nice white chewy marshmallow center. 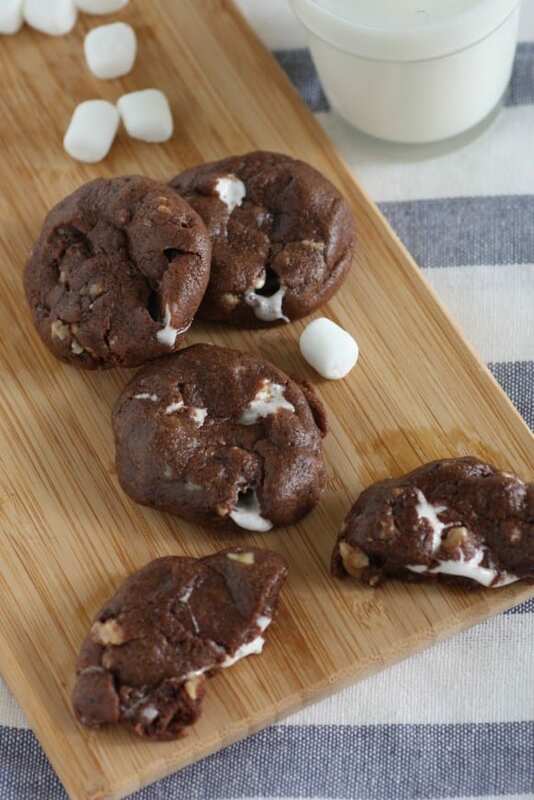 These cookies would be an absolute show-stopper at a milk & cookies party! 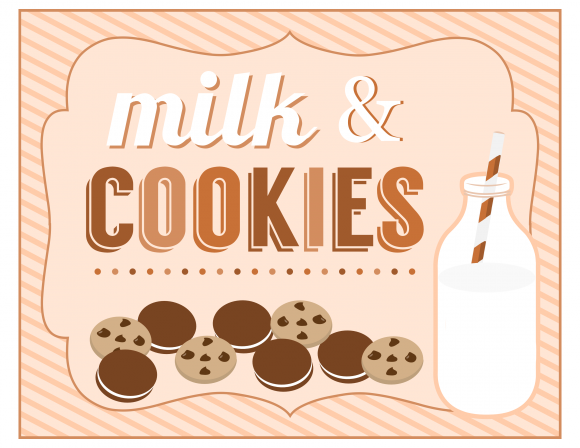 We have this entire collection of milk & cookies free printables on our site to help you decorate! Just download, print out, and have fun! looks yummy!! www.mypartyproduction.com We produce weddings, parties & events in the following areas: Agoura Hills, Malibu, Beverly Hills, Burbank, Calabasas, Canoga Park, Chatsworth, Encino, Glendale, Granada Hills, Hidden Hills, Lake View Terrace, Los Angeles, Mission Hills, North Hollywood, Northridge, Reseda, San Fernando Valley, Sherman Oaks, Studio City, Tarzana, Toluca Lake, Tujunga, Universal City, Valley Village, Van Nuys, West Hills, Winnetka, Woodland Hills, Irvine, Orange County, Anahaim and San Diego.